A common mom with an uncommon child. Talking all things gifted and some things not. We all want our kids to meet their potential. The problem is when you know your child has SO much potential the pressure is tremendous to be sure you’re doing the right thing. 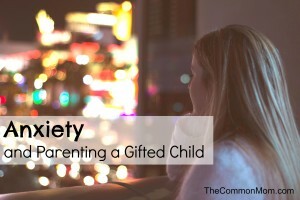 All parents worry and have anxiety over their kids but I’m not sure it’s over the same issues as parents of gifted kids. I don’t know, maybe it is. I’ve only got the one gifted daughter and she consumes almost all of my dedicated anxiety resources. Almost. When I set my anxiety about my daughter aside I find I start worrying about what’s happening to ALL children and how we should ALL care about them. I worry about the special needs kids. Unidentified gifted kids. Bullied kids. Foster care kids. Kids in poverty. Kids growing up in abusive families. Kids without enough to eat. Kids without enough to read. But most of my time is spent fixated on my own kid. My bouts of anxiety tend to start out as worrying about just one thing and then like kudzu, the worry spreads to nearly every aspect of my life. I’ve described it as having at least two soundtracks playing in my head nearly all the time. All she ever says is “school is fine” but is that true? What does ‘fine’ mean? Does that mean she really is challenged or she’s just enjoying reading Harry Potter for the 72nd time and she prefers it that way? Is that the way her teacher prefers it, too? How can I blame her? This quarter they’re studying Island of the Blue Dolphins which she read three years ago. One whole quarter dedicated to one book? Is that normal? Even if it was a new book she doesn’t need to have weeks to read and complete a study of it. Next quarter is Gathering Blue. Read it two years ago. If the teacher is ok with her plowing the same ground twice should I be ok with Harry Potter 72 times? I should limit how much she reads and steer her away from books covered in the school lessons. What the heck am I saying?? I’m NOT going to limit her reading! What is this crazy person in my head talking about?! Should I remind the teacher (again) that to be differentiating curriculum? Is this a battle I should fight? Will this help win the war of providing academic challenge? It feels like the school is waging a war of attrition and they might be winning. Good grief! She’s read Harry Potter 72 times! Need to talk with the librarian (again) about recommending new books for her. I need to do a better job making sure she has better (different and new to her) reading material for home and for when she’s done with work at school. Would it kill the child to throw a non-fiction book in her backpack? Where are those Amazon gift cards from Christmas? That 6th grade boy at the Quiz Bowl last weekend rocked the literature questions! He knew Jane Austen better than I did! Is she ready for Pride & Prejudice? Will she like it after the excitement of Hunger Games? Shoot, why did I let her read that? What other classics should she be reading now? Have to figure out how to present Dickens as being just as captivating as Rick Riordan. I like Dickens better – why doesn’t she? Stop. It. Must let her develop her own tastes. Even when they might be wrong. No, stop that! But wait, her old Kindle is broken (was broken, now destroyed – see photo at right) and I don’t want her to read at night on her iPad because of the whole backlit screen keeps you awake issue. Why didn’t I get the new one set up over the weekend? Oh yeah, spelling bee and quiz bowl tournament. And that full day of recovery. I totally needed that. Do you think Facebook friends are tired of seeing her with her trophy? Too bad! Is she getting enough sleep? Is it time to make her bedtime later? What are other parents doing? Am I treating her like a baby because bedtime is officially 8:00? She does get to read until 8:30 – but not on the iPad (get Kindle setup already!) and she’s usually asleep before then. She’s growing up way to fast. Need to start plotting out family vacations from now until she graduates. We never should have grade skipped her – that’s one whole year gone! What if she needs an additional grade acceleration? No way. I can’t do it. Surely, we can figure something else out, right? Of course she could read actual books but she’s read everything on her bookshelf. Wee need to go the library AGAIN. I wish they had better hours – why do they close so early on the weekends? Seriously, 5:00 p.m. on Saturday? I guess we (I) need to work on our weekend excitement strategy because lounging at the library isn’t happening. Ok, new Kindle finally charged and books downloaded including Lord of the Flies which she’s been asking about. Hope Piggy can compete with Katniss. WAIT! DID I DELETE FIFTY SHADES OF GRAY FROM THE KINDLE CLOUD THINGY? CAN SHE READ THAT?? Yes, yes, I did. That little burst of anxiety (abject fear) probably took years off my life. Punishment for reading that crap in the first place. We just need to get through the last quarter of this school year and then things will get better, right? Because we should know in a few weeks if she gets into the amazing gifted school. An hour away. Test scores (were the WISC and SB both necessary??) are way above where she needs to be and now we’re just waiting for the personal interview. Will she make it through that phase? Sure she will. Right? Why wouldn’t they want her in the program? She’s a well-adjusted kid, social, and gosh darn it, people like her! I’ve now started to channel Stuart Smalley and that can’t be good. But what if she can’t stop talking about Minecraft? Worse, what if she starts talking about watching Minecraft videos on YouTube? Why can’t I be one of those parents who ban the Internet – or at least StampyCat videos? Must revisit parental controls. I kind of hate Minecraft even though I know the kids are learning to create and it’s like virtual Legos…blah, blah, blah. I hate hearing about it. All. The. Time. Especially when she wants to give me details just as she’s getting out of the car in the school drop-off line. I’m becoming the parent that slows things down because of Minecraft. I try to at least appear interested as she describes the latest Redstone thing and why she decided to kill the sheep. Why would anyone want to kill sheep? What if she doesn’t talk at all? What if she fidgets the whole way though the interview? Like the chair dancing sequence during the spelling bee. Thank goodness no one had a video camera. 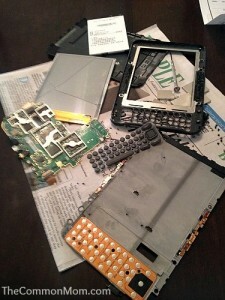 Shoot, I probably should have taken a video or at least pictures with a real camera instead of phone. Why can’t I be like all those super organized Pinterest moms? Must remember to download photos from phone. What if she gets in and the amazing program really isn’t so amazing? What if she can’t keep up with the work? What if we’re too late and she doesn’t have a growth mindset? She’s been coasting academically and racking up meaningless straight A’s for much too long. What if she crumbles at actually being challenged? I’m trying so hard not to praise her results and instead focus on her effort but, dang – it’s HARD. Where’s that book on grit? Probably deleted along with Fifty Shades of Gray. Paging Angela Duckworth! What if she doesn’t get in? Do we continue banging up against this school district’s unwillingness to meet her academic needs? Should we be satisfied with a weekly pullout program where she still doesn’t have true peers. Would the parochial school do a better job? Would they be more apt to subject accelerate? The principal says yes but I’ve been fooled before. What about online schools? Homeschooling? Unschooling? I am NOT brave enough or organized enough for homeschooling. Seriously, how the heck do those moms do it? And unschooling – that just terrifies me. It terrifies me in a way that I think I might just like it. I just need to man up. Wait, maybe I should say put on my big-girl pants. Whoa, neither of those sounds very PC for a girl-mom. Sheesh, that whole being a good role model thing really escapes me. Parenting fail. Maybe we can keep her challenged with enrichment programs. We’ve done EPGY in the past and IMACS last fall. Shoot, why aren’t we doing that again this spring? Because of that awful hour each way commute on Saturday mornings. And if we did do that she couldn’t compete on the Quiz Bowl teach which she loves. I hate scheduling. I must schedule time to figure out Evernote, maybe that will get me on track. The Duke Tip online classes look good. Can she do those on her iPad or the Chromebook or do I have to share my laptop? I don’t want to share. Maybe find a chess club and she can polish her skills. Maybe I should learn to play chess. How embarrassing that I don’t know how to play chess. Parenting fail. Again. There are excellent summer camps around here, that will help. The summer camps sound incredible. And last summer my kid went to a ‘summer camp’ at a gymnasium where she go to jump on trampolines, play in ball pits and walk to the public pool. The guilt from that is nearly overpowering. But I can’t sign her up for camp yet because if she does get into that amazing (hopefully amazing) gifted program then we’ll have to move. If we move, that’s going to keep us busy and eat up a lot of resources. And then I have to break it to her that she’ll be starting a new school for the second year in a row. And now the anxiety REALLY kicks in. Aaaargh – I’m late picking her up from school! Please tell me I’m not the only one suffering silent bouts of anxiety! This post is part of Hoagies’ Gifted Blog Hop: Anxiety. To see all the blogs writing about Anxiety click the button below. Sharing about parenting and life through the prism of raising a gifted child. These are the conversations I wish I could have had before I needed them. Not an expert, just a common mom. You can tell how smart people are by what they laugh at.